Religious mania has caused a number of people to do terrible things to innocent people, but toilets usually get out unscathed. This was not the case in Louisville recently, when police were called to a local Speedway convenience store to deal with James Crittenden's senseless bathroom arson. While it's almost impossible to spot a sociopath, it's usually not hard to spot the sort of person who lights toilets on fire. This is why the convenience store personnel burst into the restroom to confront Crittenden before calling the police. Sadly, they were seconds too late to save the toilet seat, which had burst into flames. According to the local NBC station, "Crittenden told store workers he lit the fire for religious reasons." This followed up quickly on an incident and arrest less than a month earlier at a ValuMarket in Louisville, during which Crittenden was caught huffing aerosol cans of whipped cream, presumably also because of divine providence. According to the source, Crittenden was already banned from the ValuMarket some time before, meaning that going through 10 cans of product in the store was not the beginning of his erratic and disruptive behavior. When he attempted to pay for the whipped cream he came up $16.90 short. According to the source, Crittenden's arrest report for that day mentioned that he said "he was huffing the cans to wake up and that the U.S. Constitution allowed him the authority to huff Reddi-wip." Naturally, the U.S. Constitution allows you to kill brain cells in a number of other ways as well, as long as you pay for them. 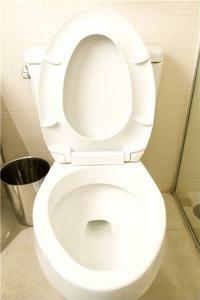 As for the toilet, it was mostly the seat that took the brunt of the damage. Luckily for the bowl, porcelain is inflammable, which means that although it may bear scars from the attack, it's getting off no worse for wear. The seat is another story, but perhaps this experience will inspire the Speedway convenience store folks to invest in a bidet seat attachment, which, among its many excellent uses, could potentially help put out a fire. Where Crittenden is headed next is unclear. Hopefully he finds some peace of mind somewhere outside the aisles of chain convenience stores. If it happens to be prison, one thing's for sure - those metal toilet seats are 100-percent fire-resistant.